Fit-Ink: Chasing an Olympian: Kara Goucher is hard to catch! Chasing an Olympian: Kara Goucher is hard to catch! I swear that's Kara Goucher's back side. Chasing an Olympian is tough work. I know, I just returned sweaty, thirsty and a little achy from a run where I did exactly that. That Olympian was Kara Goucher, who happens to be in Colorado Springs with Shalane Flanagan, Alan Webb, Lopez Lomong and a few other Olympic-caliber runners. They're training in and around the Olympic Training Center for three weeks--or so I learned from John at the Colorado Running Company (tip: befriend your neighborhood running store. They are pools of information.) and later confirmed by reading Innovation for Endurance. I ran right by her at first. But there was something about the magenta top, capri tights and Nike Frees (at least I thought that's what she was wearing) on the ponytail-bobbing, sunglass-wearing runner that made me do a double take. This wasn't just an anonymous runner. 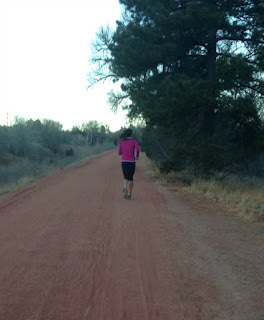 This was Kara Goucher trying to be anonymous--or maybe simply running. It had to be her. The ponytail swinging. The dark hair. The build. The Nike outfit and Free shoes. Sure it took a few seconds to piece it all together, but when I did, I aborted my run route to follow her. After all, it's not every day you can run with, er behind, an Olympian. If you've followed Fit-Ink for a while you know how big of fans we are (I knew it was bad but I didn't realize we had all these Kara mentions), and you know how excited we'd get at the prospect of being that close to one of our running idols--and semi-running with them. And that's especially true when you've missed literally every other opportunity to run with her from Chicago media visits to running Boston in 2009 and sharing the same course (all stuff Liz has been lucky enough to do while I, in turn, could grow more green with envy). Do you try to catch up? Do you shout and ask for a picture? Or do you leave her alone like any other runner on the trail? Instead of thinking about my actual run workout, those thoughts are zipping through my head. I'm not listening to the music blaring through my ears or glancing at my Garmin to keep me on track with my paces, I'm thanking myself for grabbing my iPhone before heading out the door and readying it for a picture. I'm gaining on Kara. The camera lens doesn't lie: The pink and black dot (Kara) grows closer. I went with the first and third options, thinking that maybe I'd have that photo op. I was gaining on her, so it could be possible. But I should have known better. An Olympian merely warms up at 8:30 pace. Once those warm-up miles are done--or she realizes she's being followed (maybe she heard the camera clicks?) --Kara sped up. And my legs didn't (hmm, I sense a pattern here). They tried, but they were near sprinting as she settled into what I'm guessing was tempo pace. And my lungs were fighting for air. The phone call to hubby to tell him to go out to the path to watch Kara fly by was beyond incomprehensible. Kaaa gaucho onrail no (insert heavy panting). Um yeah, that's code for: Kara Goucher's on the trail right now. So much for that photo op with Kara. Does photographing her back count? I even thought I had redemption a mile later when I spotted a magenta dot crossing the bridge across Fountain Creek. Like a skilled paparazzo, I tried to approach from the opposite direction and had a shot framed perfectly. Too bad it was another runner (cue ho-hum music). Kara was long gone, probably already back at the Olympic Training Center where she's staying while in Colorado Springs. Here's my dilemma. Instead of options one (sprint to catch up) and three (leave her alone), was I supposed to interrupt Kara's run to get that picture or better yet, ask if I could run with her? I'm the runner who hates to have her run interrupted (I said a quick hello to my Miles & Trials friend Wendy a few months ago but kept on running) even when I'm hurting, aching and oh-so-ready to quit. Would I really want to do that to someone else? And how would that runner feel? So tell me Fit-Inkers, should I have stopped Kara Goucher for my Kodak moment? What's your take on getting interrupted mid-run? Have you considered applying to be a newspaper writer? Extremely wonderful writing!have a good work to Olympian.